OBAMA Lures Massive German Crowd With Rock Bands, Brats & Beer! 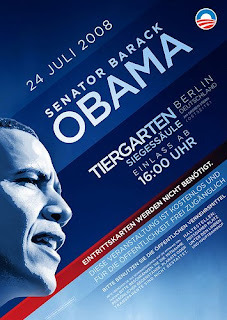 The choreographed Obamapalooza Tour 2008 continues in Berlin today complete with with rock bands, beer and brats. Oh… And, German campaign flyers. But remember- It’s not a political rally. The speech will begin clock to 19 and up about 20 clock time. Admission to the event area is from 16 clock. At 16 clock begins the inlet to Obama spectacle on the streets of the 17th June. For the spectators, the further back have been enlarged picture screens. To the waiting time of up to the speech of the presidential candidates to shorten a second stage built on the musical framework programme to take place. The German Reggeasänger Patrice and the German pop band Reamonn 17.30 from occur there. Before and during the breaks, the British disc jockey Mantu. Snack and drink stalls are also up – the area is converted Fabnmeile-Obama. The Afghanistan War protesters were not allowed to protest the event. HERE’s a video of a Raemonn rock concert to give you an idea of what kind of crowd you might expect today. The Moshpit of America-haters await Obama. Obama may demand on the campaign trail that no one dare question his patriotism, but for Germans, disliking the U.S. is nothing to hide. Yet this is the place Obama’s team thought would be best to hold a rally to boost his campaign. Pew’s 2008 survey found that 34% of Germans don’t like Americans at all or in part, and 61% regard the U.S. as headed for something like history’s ash heap, to be supplanted by China. Heck, it was a battle just to get him, a candidate for the highest office in the land, to pin an American flag to his lapel. No wonder they cheer Obama in Germany. Don’t expect to see this reported by the mainstream media. More… The US Embassy told its staff to stay away from the “partisan political activity” today.